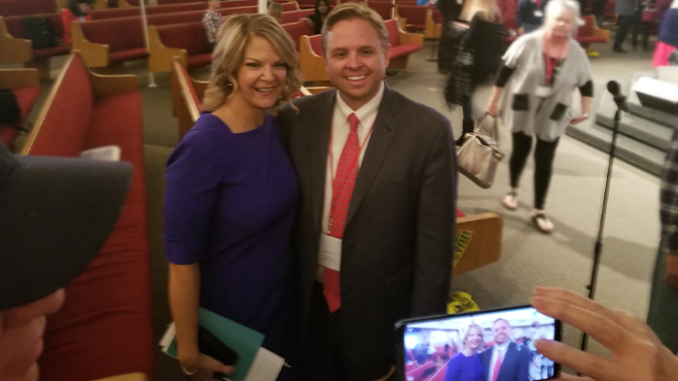 Dr. Kelli Ward and Jonathan Lines pose for pictures after he concedes race. PHOENIX — Saturday was the first time I attended an Arizona GOP Statutory Annual meeting, and it was truly a positive experience. It was a long day for me, after returning home at 12:30 a.m. after a week-long business trip. I got a couple hours of sleep and woke up at 5 a.m. to travel from Sahuarita to get to the meeting by 9 at a Phoenix Church. I’m happy to report that out of our 11 elected state committeemen, we had 10 present and we carried the proxy for the other committeeman. Looking around the room, where more than 1,000 Republicans were gathered with flags showing where each legislative delegation was seated, reminded me of our presidential conventions. We heard from Republican members of the House of Representatives, U.S. Sen. Martha McSally and Gov. Doug Ducey. Following the guest speakers, we heard from Chairman Lines, our treasurer (who ran unopposed for an additional term in office), the nominating committee and the credentialing report. We heard 3 minute speeches from each of the candidates, including those who were nominated from the floor the day of the meeting. During the credentialing report, everyone got to hear how proxies were abused in this process. For each legislative district , we heard how many state committeemen were in attendance and how many proxies were being voted – providing a total votes by district and grand total of votes which could be cast. A number of districts carried large numbers of proxies, and I was shocked that several districts including some in Maricopa County were voting about 50 percent as proxies. State committeemen have just one job – to attend this annual meeting and vote on our state’s GOP leadership. I realize that some people had to travel long distances to be present, but everyone should know when they raise their hand to volunteer, what they are signing up to do. As a frequent business traveler, I understand the need to have the ability to vote via proxy; however, it should be a small percentage of the total votes cast. In my humble opinion, proxies should be limited to a small percentage of the people present, with flexibility shown to smaller counties – for example, limit proxies to 10% of the state committeemen present unless a county has less than 10 state committeemen. For smaller counties, a higher percentage could be used. During the meeting, a gentleman called for a vote to invoke a clause in our bylaws that requires a roll call vote when 10% of the voting body requests it. After much discussion, it was brought to a vote and more than 10% demanded a roll call vote. Those who were opposed to the roll call vote stated they wanted to protect their ability to a secret ballot, while those who supported the roll call vote did so out of lack of confidence and trust in voting electronically. Since our bylaws did not say that we could not conduct a roll call vote by county or district, we referred to Robert’s Rules which clearly stated we could – and we did. In conducting a roll call vote, each county chairman had the option of providing a vote breakdown by county or legislative district. One LD which had only one vote within their county was permitted to combine their vote with the same LD in a neighboring county to protect their anonymity. Both Pima and Maricopa counties opted to announce their votes by Legislative District. The entire process reminded me of how each state announces their votes at the Presidential Conventions. It was left up to each LD and/or county to determine how to collect their votes. Our LD opted to have each person write down their vote and turn it into our LD Chairman. Once we had a folded piece of paper from each State Committeeman, our Chairman casted his vote and the vote for the proxy he carried. We then shuffled the votes where we didn’t know who submitted which piece of paper and our Chairman and I (as 1st Vice Chair) counted the votes together. Therefore, our State Committeemen were able to still cast a secret ballot. It also occurred to me that when our founding fathers signed the Declaration of Independence they did so knowing they were putting their lives on the line. Even if I would have needed to cast my individual vote in front of everyone in the meeting hall, I would have still proudly cast my vote for Chairman Ward as most State Committeemen did that day. When we make decisions out of fear – fear of “not getting money if we don’t toe the line” – we become part of the establishment. I would rather help give a voice to the grassroots – my friends, relatives and neighbors who have felt for too long that nobody cared about what was important to them – nobody was listening. Across all the Arizona Counties, Chairman Ward received the most votes in 9 counties including Maricopa County, while former Chairman Lines received the most votes in 4 counties including his home county of Yuma. The notes taken by a member of our legislative district showed a couple of counties did not vote when voting had closed; however, when the official tally of votes was announced, the count was 10 votes higher – so it would appear that at least one of the two counties were permitted to vote. One of the counties announced they were abstaining from voting during the voting process. Now is the time to become a PC and make your voice heard – contact your legislative district party leader or PC and get started – you are the future of the Arizona Republican Party!